On last year’s split album with Fragment, I couldn’t help noticing the similarities between Iroha and Jesu. This is certainly not unexpected, considering that Iroha band leader Andy Sway used to have a common musical past with Jesu’s Justin K. Broadrick. Another parallel is bass player Diarmuid Dalton who’s playing in both bands. 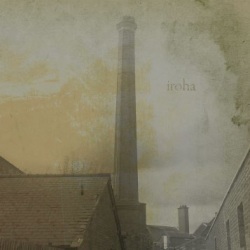 A short year later, Iroha are back with their self-titled debut longplayer, and not that much has changed. Don’t let yourself be scared off by the nearly two hour running time, because we get twice the same set, on the first disc mixed by Iroha themselves, on the second one under the surveillance of naturally none other than Justin K. Broadrick himself. The CD version contains furthermore three additional remixes where only the last one by Black Galaxy does something dramatically different with the material by adding some strange dark dance beats. It’s up to you which version you prefer. The Iroha mix is more basic, while the JKB mix gives more emphasis to the synthesizers and makes for an overall lusher sound, which I actually prefer, I have to admit. Otherwise you’re in for a good three quarters of an hour of slow paced shoegaze extravaganza. Iroha are certainly less indie than for instance My Bloody Valentiny, but not heavy enough to be labelled a metal band. All in all it’s very pleasant if you like your music on the more depressive side. The vocals have a soothing subdued quality, the guitars are heavily distorted and create strong atmospheres that are fleshed out by the subtle use of electronica. Fans of Jesu won’t do anything wrong by spending their money on Iroha. You might accuse them of lacking originality, but considering where Andy Swan comes from, he definitely has the right to do what he’s doing here. And you don’t often meet an artist who instantly provides two different mixes in order to allow the audience to choose their preferred version.